Provost Maurice Edington and FAMU President Larry Robinson (pictured L-R) discussed the plans and initiatives in place to increase student success at the university during the "Coffee and Conversation" event Wednesday, Feb. 27th. Photo Submitted by Diasha Henley. 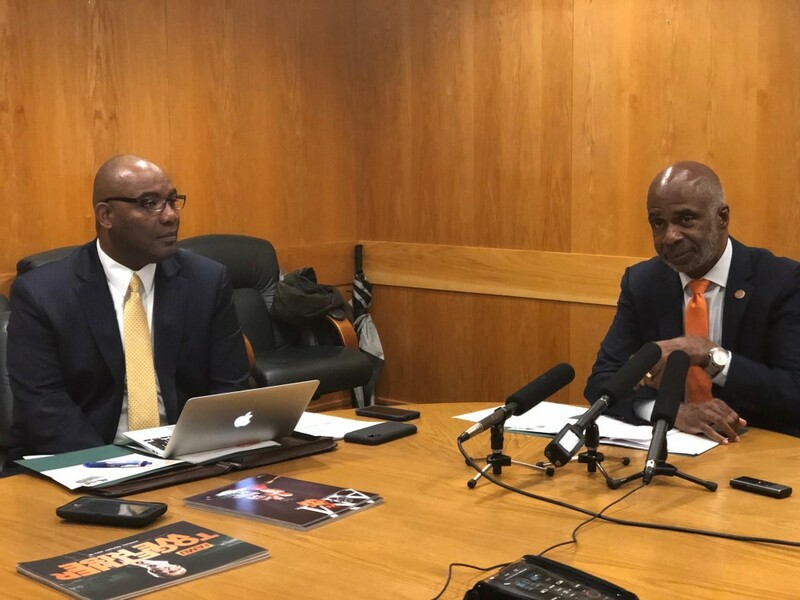 Florida A&M University’s President Larry Robinson and his team hosted a “Coffee and Conversations” event on Wednesday, Feb. 27 for FAMU’s plans for the upcoming legislative session. The purpose of the event was to inform local media outlets about the current status of FAMU and where the university is headed. Executive Associate Director, Kathy Times set the tone of the event as she greeted the crowd. “We are hoping to have an open conversation with the media quarterly to ensure open communication between the university and the media,” Times said. As a whole, the university has high hopes for additional funding in the legislative session to continue the growth of the university. In an effort to improve student success at FAMU there are a number of areas of priority known as the University Strategic Plan. These areas include student experience, renowned faculty, notable research, alumni engagement and business infrastructure. One topic discussed was the need to accommodate the rate of students enrolling at the university who may need on-campus housing. Provost Maurice Edington expressed his faith in the changes being made to keep track of the progress of FAMU. With the demolition of the McGuinn and Diamond dorms to make way for the upcoming amphitheater, the biggest concern was how to provide room and board for incoming freshmen. At the meeting, Robinson also mentioned the potential demolition of the Truth, Palmetto North, Cropper and Wheatley, and the Paddyfote Complex. Robinson assured the media that he and his team were prepared to take the necessary steps for a smooth transition. Also discussed at the meeting was the increase in applicant rate for first time in college students. According to a sheet given to event attendants, there were 4112, 5559, and 6749 applicants for the Fall 2017, 2018, 2019 respectively. These numbers are solely from applicants who are the first in their home to attend college. Also mentioned on the sheet was FAMU’s trending numbers in enrollment which reached 10,031 applicants for Fall 2018. The administration has a goal of 12,000 applicants for the Fall 2020 semester. With the legislative session vastly approaching, Robinson went on to explain how he had been to the capitol building numerous times advocating on behalf of FAMU. He said one of the main goals of the university was to ensure student success. According to U.S. Department of Education’s National Center for Education Statistics, FAMU was named No. 1 and No. 2 top producer of African-American Bachelor’s and Doctoral degrees in the nation. As the meeting ended, Robinson and his team were hopeful about the bright future they envisioned for the university.